3rd year Pic 311 - Aug 24 2011 Drongo dive Khem Vilas, Ranthambhore The Drongo was diving to catch a worm or a small fish. These insectivorous birds are found in usually open forests or bush. Most are black or dark grey in colour, sometimes with metallic tints. They have long forked tails, and some Asian species have elaborate tail decorations. They have short legs and sit very upright whilst perched, like a shrike. Racket-tailed Drongos are the mimicry artists among birds. They can mimic the sound of other birds and some animals. They flycatch or take prey from the ground. Two to four eggs are laid in a nest high in a tree. These are aggressive and fearless birds, given their small size, and drongos will attack much larger species if their nest or young are threatened. http://en.wikipedia.org/wiki/Drongo Thank you all for your comments on my Drongo series yesterday! 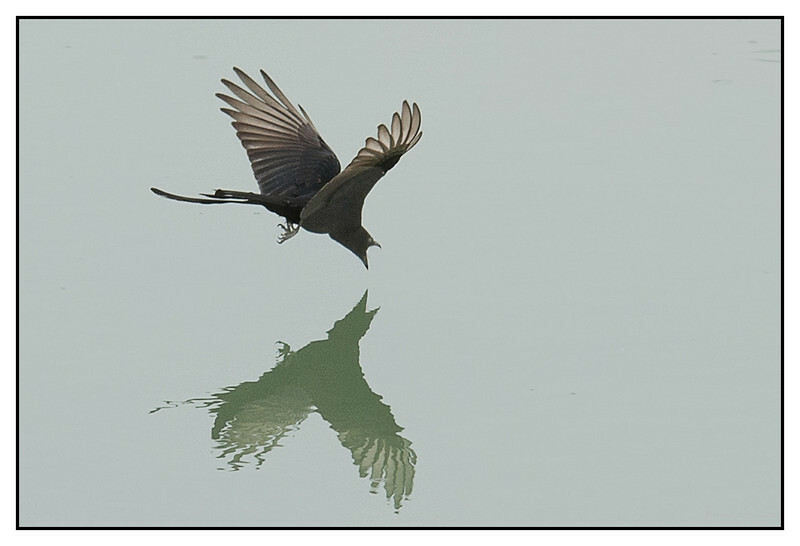 What a spectacular pose and reflection of this Drongo. Superb timing of this incredible bird. Oh, that's nice. Can just feel that mouth full of water.